Whether you're a farmer, a grower or a keen gardener, a MATABI provides you with high-quality, well-pressured and hard-wearing watering implements - ones that range from knapsack sprayers to your bog-standard (but no less well designed) handheld devices. Based in the rainy north of Spain, MATABI have been producing agricultural sprayers for more than fifty years, and their design is a product of these decades of experience. The company's new patented Pressure Regulator technology, for example, ensures even, accurate application of water onto your crops and circumvents the ever-costly overdosing of water, feed, pesticides or any other fluids onto your valuable plants - which is also of significant benefit to the environment. 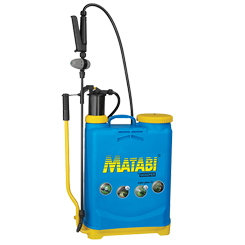 With dedicated sections of products that range from garden sprayers - these encompass anything from small items for average gardens to far larger ones better suited to vegetable patches and allotments - to industrial implements which are ideal for use on farms, MATABI are a safe bet for any watering needs. After purchase, you can be rest assured that your sprayer is going to serve you very well. The three-year parts guarantee is also there for your peace of mind.